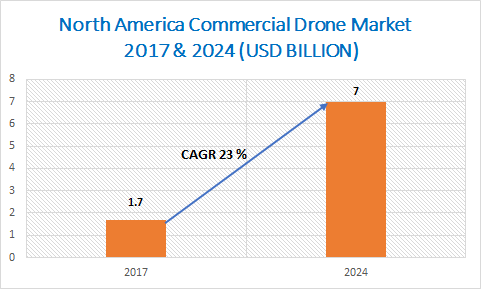 North America Commercial Drone Market size in 2017 was estimated to be over 82 thousand units and is anticipated to grow at a CAGR of 25%, with a market value of more than USD 1.7 billion and is anticipated to grow at a CAGR of 23% over the forecast timespan. The North America commercial drone market is growing due to the relaxation offered by FAA to run drones for commercial purposes. Drones have been used for video and photography since the development of commercial UAVs. However, from the past two years, their capabilities have been leveraged by different industrial sectors such as agriculture, real estate, architecture & construction, delivery, and media. A well-defined regulatory environment coupled with the increasing adoption for commercial applications will drive the market in the region. Venture capitalist and angel investors are investing in the UAV space, encouraging technology start-ups to explore opportunities in new applications and customize according to the different verticals. 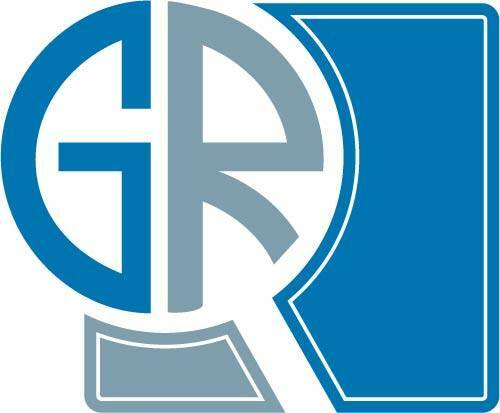 Rotary blade drones account for over 77% stake in the North America commercial drone market. The growth of the market is due to its ability to take off and land vertically, which makes them suitable for applications such as targeted photography and inspections. On the other hand, the hybrid drone market is predicted to grow at a CAGR of over 26% during the forecast timeline due to their mixed features of the rotary blade and fixed wing. Aerial photography applications are dominating the UAV market with a share of over 32% in the revenue. The market is growing due to its wide adoption of monitoring and surveying of remote locations in the region. Moreover, commercial drones are also being used for monitoring disaster-affected areas, providing aid to the victims, and for search & rescue missions. The inspection and monitoring application will have the fastest growth rate due to the wide use of commercial drones by emergency responders. The U.S. is a leading the market of North America with a share of 89% in 2017 and expected to maintain its share till 2024, due to the adoption of UAVs for civilian applications and market awareness for civilian drones. The country is experiencing difficulties in the adoption of commercial drones in the market due to specific rules and regulations by the FAA. It is expected that the diligently crafted Part 107, which summarizes small unmanned aircraft rule from FAA is going to receive some relaxation over the forecast period. However, until then, the technology giants of the country need to abide by the challenges presented by such stringent regulations. Canada will be the fastest growing market due to the government’s take on adoption and exploration of commercial drones to cater to the innovations in the technology of unmanned vehicles. The North America commercial drone market is characterized to be extremely competitive due to the presence of several multinational and regional players. Parrot, 3D Robotics, DJI, Yuneec International, Walkers Technologies, GoPro, Avular, Intel, BAE Systems, Cyberhawk Innovations, Delair-Tech, DJI, Flyability, Guangdong Cheerson Hobby Technology, Lilium, Pix4D, and Xiaomi are some of the major players in the market.